Munich Franz Josef Strauß Airport is 28.5 kilometers north-east of the centre of Munich, capital of Bavaria. Munich is the second-busiest passenger airport in Germany and ranks seventh among Europe’s ten leading airports. There are good ground transportation options for passengers arriving at Franz Josef Strauß Airport. MVV, the organisation responsible for public transport in Munich and its surrounding areas, runs bus services from Munich airport to various parts of the city. For the list of services and timetables, see www.mvv-muenchen.de. Lufthansa operates an airport bus service to/from Munich city centre. Travel time to Munich North is approx. 25 minutes and to Munich Centre (Main train station) is approx. 40 minutes. See the Lufthansa airport bus website for departure times and fares. Some hotels provide shuttle transfers from/to the airport, so check this with the hotel at time of booking. If your hotel does not provide transfers and you would like a private transfer directly to your hotel, you can pre-book this through Viator. The airport S-Bahn S8 rail link goes from Munich Airport via Ismaning, Ostbahnhof, Isartor, Marienplatz, Karlsplatz/Stachus, Hauptbahnhof (Main Station), Laim and Pasing to Herrsching and back. At the Ostbahnhof, Hauptbahnhof (Main Station) and in Pasing, passengers can transfer to the mainline and regional train services. Travel time to Hauptbahnhof (main station) is about 41 minutes. The airport S-Bahn rail link S1 travels from Munich Airport via Neufahrn, Moosach, Laim, Munich Hauptbahnhof (main station), Marienplatz to Ostbahnhof and back. At the Hauptbahnhof (Main Station) and Ostbahnhof, passengers can transfer to mainline and regional train services. Travel time to Hauptbahnhof (main station) is about 45 minutes. The major car rental companies like Avis, Europcar, Hertz, National/Alamo, Sixt and Terstappen all have counters at Munich Airport. – Pickup is from the Car Rental Center in the Central Area where you are handed your car keys and papers. – Return of rental cars is opposite to parking area P26 and north of P9: when returning the car, you leave it with the service crew just inside the entrance, the keys and papers stay in the car. If getting the right model rental car and at the right price is important to you, you can check out the cars and rates and pre-book your rental car through Auto Europe. 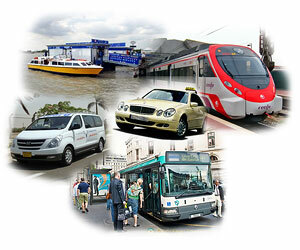 Auto Europe also provides limousine services and private airport transfers. Munich Airport is easily and directly reachable via the A 92 Munich-Deggendorf autobahn. Long and short-term parking are available at Terminals 1 and 2.